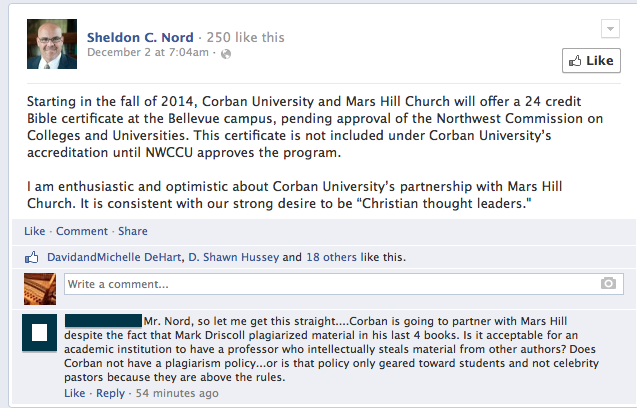 Corban University President Sheldon Nord removes public comment questioning the university’s partnership with Mark Driscoll’s Mars Hill. It has come to my attention that a comment was removed from the Facebook page of Corban University President Sheldon Nord. I discovered Corban University President Sheldon Nord’s Facebook page after writing this article, Mark Driscoll’s Mars Hill Bellevue Campus to Host University Classes in Fall of 2014. The comment was beneath a post announcing the partnership between Corban University and Mark Driscoll’s Mars Hill Church. I happened to see the comment and took a screenshot of the page . . . just in case. I contacted the commenter to see if he had removed the comment and he confirmed that he had not. what’s even more disturbing is his comment about being ‘christian thought leaders.’ Now they are going to tell you how to think? Not surprising if they are aligning with MH and Driscoll. So, what is Corban’s policy on plagiarism? Here, Paul. Someone posted this on the other thread about the new joint venture. This comes from a course syllabus posted by the adjunct instructor at this web address: http://www.epm.org/static/uploads/downloads/theology-of-heaven-syllabus-corban-final.pdf . This course was held in May 2012. If I were the president of Corban, I would have removed that comment, too. It is libelous and could open the school to lawsuits. Driscoll has not been convicted of plagiarism in a court of law. The commenter could have made the same point sticking to facts (What is Driscoll’s academic preparation and record, and is this a credit to Corban? Is this series of classwork academically rigorous enough to meet Corban’s standards?). Even if I agree with the commenter, I also understand why the comment was removed. PJ, hasn’t MD confessed to some of the plagiarism? I have heard that he is prone to lawsuits, but think it unlikely he would sue the partner university for another peson’s FB comment. Patty, you need to become acquainted with the law on libel before you talk about it. A comment is not libelous because someone has not been convicted of what he is being accused of. In fact, it is the responsibility of the plaintiff to prove first that it is false, not the responsibility of the respondent to prove that it is true. And it doesn’t become a fact only by being proven in a court. Especially in the case of a public figure such as Mark Driscoll, it can be libelous only if it is published with knowledge that it is false or with a “reckless disregard” for the truth (New York Times Co. v Sullivan, U.S., 1964). In most states, such an action would be considered a Strategic Lawsuit Against Public Participation (SLAPP), subjecting the plaintiff to a motion to strike and making him responsible for the fees and costs of the respondent. It’s quite likely that if Driscoll sues anyone about this that he will pay handsomely. Nord didn’t remove the comment because he was afraid of a defamation action. He just didn’t like the issue being raised. Let’s keep things clear. The Facebook post doesn’t mention Mark Driscoll by name. How do we know that the partnership is not with Rob Bell’s church, which is also called Mars Hill? Confusing, I know. pjclutterbuck: I covered this in another article in which I linked to a YouTube video with Mark Driscoll explaining this partnership. Mark Driscoll also mentioned that he would be teaching. Ummm, but if you’re surprised by a college president suppressing free speech, then you haven’t been paying attention to colleges. The conservative colleges have been at it just as long as the liberal ones. My question is why would anyone think that someone’s or some institution’s facebook page is your venue for free speech? Seriously, JA, you go a lot farther than most folks do, but you have removed comments, at the request of commentors, and on your own. Seriously folks, extract your heads from your rectums and realize that anyone that runs a site has the right to approve or delete comments from their own sites as they see fit. And quit whining about someone else’s moderation style. If you don’t like it, then start your own site and do as you please. The right to freedom of expression doesn’t function the way some of you seem to think. And some of you seem to think that your Jesus is going to step up and whip the asses of anyone that doesn’t agree with you. The only thing that attitude does is confirm that those of us that have walked away from your idea of Jesus are right in doing so. Thanks for the update. I haven’t been following the story until now. God bless, and have a happy New Year! Whoa, what happened? Eric Fry used to have some useful things to contribute! I guess anyone can do anything they want with their FB page and in turn, anyone can say anything they want about the way someone runs their FB page. There are consequences one way or another. Personally, I like when people aren’t afraid to face the issues and don’t delete what someone’s said on FB. I guess my question would be how has Mr. Nord’s response been when others have questioned him on the decision to partner with Mars Hill? Has he been open to hear and discuss the concerns of others? Peter, I am sure you are correct; I am not a lawyer–I MET one once, though :0) My bet is that there are going to be regrets on this arrangement, all the way around. Probably the college president wishes things would have been better thought through before the relationship was established and publicized. FB and social media brings up a lot of interesting stuff about free speech… If someone makes comments I don’t like on my FB wall, do I have to leave them there? What if those remarks improperly represent me and what I believe? It might be MY free speech to delete them. It might also depend on whether someone is public person or just a regular person, as to what might be expected from them. If I were the president of the college, I might have a separate “page” (the public person kind) for my role as compared to my personal life. I don’t know how the college president is running his social media situation, so I’m musing in general here. Interesting stuff, but not interesting enough for me to get a law degree, that’s for sure. As if. Patty Joanna, I think you hit on an important point. That particular Facebook page is a public page set up to share items of interest with the university. It is not his personal Facebook page. The college president is a person of public interest. He represents an entire institution with many students affected. Were their voices heard? Never ceases to amaze me how people want to be well known and popular for what they say/believe/preach but can’t handle honest questions or concerns publicly. Although it would have been better to address the comment graciously even if it was perceived as hostile, human nature being what it is, I am not surprised that the comment was deleted. People are more likely to respond positively to questions that are worded as sincere requests for information and not as accusations. Once questions have been raised in a respectful manner, if they are still dismissed or silenced, it is easier to discern that the motivation is to be authoritarian. I am not surprised the comment was deleted. Many of these folks want 110% control and will dismiss what is said. Neo-reformed theology is about power, business and money. These isn’t about the Lord at Corban….this is about money, power and recognition. To proceed forward with all the plagiarism accusations President Nord is proving that PT Barnum is right about suckers. President Nord’s response to plagiarism is appalling. Here are some other incidents of how other universities or schools handle plagiarism. Grinnell College in Iowa forces an Economics Professor to resign. There are many other examples in cyber space and when looking you can see how many universities from Yale, to University of Connecticut, Arizona State, University of Illinois – Champaign, etc… respond to plagiarism. Meanwhile Corban is going to partner with a known plagiarism. If I were alumni I would be going through the roof. I noticed on President Nord’s page that he highlighted how Corban took in a number of military veterans. Do you think you can get away with plagiarism in the armed forces? What would happen to a cadet at West Point, Naval Academy or Air Force Academy if they plagiarized? You seem to have mixed up a couple of issues. Nord has the right to delete any comment he wants from his forum, which seems to be your point – but no one here has disputed that. The other issue, quite distinct, is Nord’s unwillingness to deal forthrightly with questions and to be accountable. This has nothing to do with free speech, and nobody here says it is, as far as I’ve noticed. It has nothing to do with the laws of the United States or any of its subdivisions. It relates to, for instance, the apostle Peter’s statement that Christians are required to have an defense to anyone who questions us. If he doesn’t want to do that, he needs to shut up about being a Christian thought leader, until he feels like thinking and acting like a Christian follower. If he doesn’t want to do that, he needs to shut up about being a Christian thought leader, until he feels like thinking and acting like a Christian follower. To be fair, Julie Anne raised this as a Free Speech issue in the original post. As a parent, if I saw that a university that my child was going to attend (and I’m giving hard working money toward) does not seem to care about academic integrity, I would not allow my child to attend. However, I wonder if many parents who send their kids to Corban do not pay attention to this. They probably have heard about and know about this university from their youth pastor. It may be known as a “good Christian college” and that’s all that they care about. JA, I looked at your link for worst Christian book covers and was shocked to see one written by my college minister’s wife. It is definitely a small world. Her book is #6 on the list in case anyone is curious. Now back to the original topic of conversation. President Nord’s refusal to acknowledge the controversy and honestly discuss it is only going to hurt his own reputation and that of his institution. I’ve noticed that public figures often shut down when they are afraid of the truth. It was weird. I’m curious if anybody here (or on TWW) has read it given the recent obsession in the American Evangelical community with church planting. I know that her husband started their church “from scratch” in their home and eventually into an elementary school gymnasium so I’m guessing the book isn’t geared towards the Acts 29 version of church planting. I’ve never heard of any of those books on that list. The church planting concept is so weird to me. It seems like we have churches on so many street corners. I fail to see the need to establish more churches. Church planting got it’s start with Calvary Chapel/ Vineyard Movements and was promoted in book form by the likes of C. Peter Wagner back in the 80’s and early 90’s. It’s really a form of American commercial franchising, baptised by the church. Wagner and John Wimber were very into demographics, statistics, and church marketing techniques. Actually, in the 1950s, the SBC and various related state/regional associations of SB churches were very busy creating new churches in what they called the “mission fields” of the West Coast, North Central US, and NE. The church I grew up in, with guidance and assistance of the then Home Mission Board and state convention, would attempt to start at least one new church per year, with an expectation that about half would take hold and grow beyond a few families. Each year, we would organize, with college student “summer missionaries” bible schools at two locations, one a repeat from the previous year and one new site, each lasting two weeks. There would be a “parent night” and usually a week-long revival preaching the second week. The target was communities that did not have an SBC affiliated church. If the mission church was successful, it would be organized on its own at some point as a separate SB church. The mission pastor frequently received some stipend from the HMB for a year or two. So it is not a new phenomenon.